What have you won in 2016? Share your story and let us know. Here are some interesting prizes our readers have won. Do you win more from sweepstakes posted on SweetiesSweeps.com or member-only and local sweepstakes posted on SweetiesSecretSweeps.com? What do you really want to win in 2017? Two sweepstakes are coming tomorrow only – New Year’s Day 2017 – with hourly codes,and hourly prizes. Sign up to get an email reminder so you won’t forget to enter. 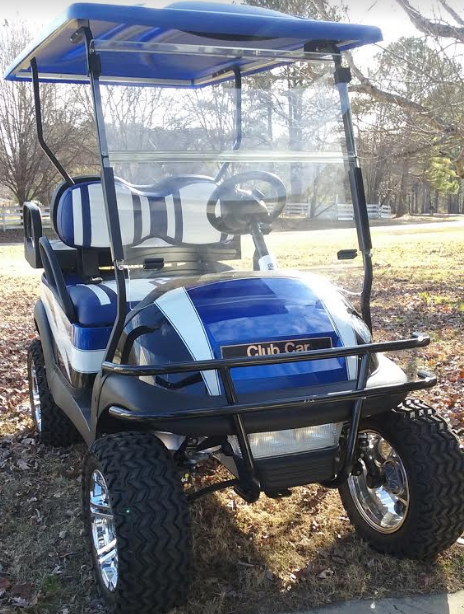 Linda Hastings shared a photo of the Golf Cart her husband Doug won in a Grizzly Sweeps earlier this year. How many of you won the $1,000 from HRBlock earlier this year? I hope they host another sweeps in 2017. Melanie Said: I wanted to let you know that I won a trip for 2 to the Super Bowl from a sweepstakes on the secret site. I would be happy for you to share it on your Facebook page, but request that you only use my first name and last initial. Thanks for all your postings. Mary said: I just received Instagram message that I won a Dynaglo gas grill, Grill cover, and a grill rotisserie kit. $747 value. Thrilled to win this! My husband and I just bought a new house and the backyard is finally big enough to entertain! Lyra Said: My husband won a prize in the litter robot sweepstakes—worth more than $1000! Biggest win in quite awhile for our family. Mary Said: Received email on Dec 21 and had 5 days to send Affidavit back. Won two tickets on Alaska Air or Virgin America. I think they gave away 600 tickets in this sweeps (on the Secret site, other winners listed here). I am lucky I saw this email in time. I have been so busy finishing up Christmas shopping for my family that I have not been too diligent on checking emails! Prize value is $1100. Nice way to end the year. I was beginning to think December was a dud. I had 3 big wins for 2016, (and a bunch of little ones). I won $1000 from H&R Block. A trip for 4 to New York City to see a MLB game from American Family Insurance. And a 7 day Caribbean Cruise for 4 on a Princess ship including airfare from the Dish Network. I had two wins worth mentioning. Dual monitor arms for my desk and a GTX 1080 graphics card 🙂 Combined ARV around $875. Not too bad! My new years resolution is to finally win a vacation trip somewhere. I’m grateful for sweetiessweeps, it is my go-to site for new sweeps. Curiously, both of the prizes I won were in sweeps that weren’t listed on this site. This was probably my worst year for winnings. Very few, small wins, few and far between. However, the one big thing i did win was a weekend in Las Vegas. Went with my best friend and had an awesome time and many memories to cherish! My biggest win for 2016 was from BravoTV top Chef on twitter. It was a trip for 2 to the Aspen Food & Wine festival. it was certainly the highlight of my year. My friend and I got to taste and drink so many good items. We also enjoyed after parties and meeting celebrities like Andrew Zimmern. I won the the $250 Molly Maid Gift Certificate in our “Season’s Cleanings” Sweepstakes! A trip to Vegas AND a trip to Barcelona, Spain! 2016 has been a great year for me. I won a $50 Visa from Butterfield, $1000 from H and R Block, several candy coupons, gift cards from Belk and Ettica, compass, Keychain, bottle opener, lighter from Marlboro, 2 tickets to a music festival, pet food, air filter from Valvoline, a trip to New York City to see Ellie Goulding from I HEART RADIO, a trip to Long Beach, California to see Panic at the Disco from CBS radio, 2 backpacks from Marlboro, Reynolds wrap paper products, set of wine glasses, toothbrushes and mouthwash from Fireflys, balloon bouquet, a box of chocolates, $30 movie code from Parliament, meat rub and hunting pouch from Marlboro, t-shirt from Domino’s, hat from Napa, $25 Visa from chicken of the sea, giant cookie from Gourmet gift baskets, and a kitchen bakeware set from Zak Designs. I’ve been playing sweeps for over 2 years and I feel blessed. Good luck to everyone!